New Delhi, August 13th, 2015: Fortis Escorts heart Institute has proved yet again, why it is one of the premier most cardiology institute in the country. In the rarest of cardiovascular procedures, doctors at the Fortis Escorts Heart Institute placed a Multi-layered Flow Modulator (MFM) to cover the Aorta aneurysm (an abnormal bulge in a portion of the blood vessel) in a 70 year old Iraqi patient, creating history. This new procedure was done under general anaesthesia, a first in the Asia Pacific region. The team of doctors who performed this path breaking procedure was led by Dr. Atul Mathur, Director Interventional Cardiology and Dr. Yugal Mishra, Director Cardiovascular Surgery. When Fadhil Hamood, the patient came to Fortis Escorts for treatment, it was identified that he required a bypass surgery. While the Bypass Surgery was successful a subsequent evaluation revealed that the patient had a diffuse aneurysm leading to the dilation of the Aorta in the thorax and abdomen. This dilated portion was at a very high risk of rupture leading to sudden death. The main branches to the intestines and kidneys were also arising from the diseased dilated segment. The standard treatment of the Aortic aneurysm is either by complex open surgical repair or by placing non-surgically a branched stent; the latter procedure would exclude the aneurysm. Both these procedures have high complication rates. 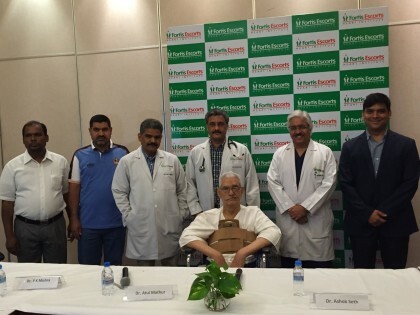 The team of doctors at Fortis Escorts Heart Institute decided to perform a new treatment by deploying a multi-layered flow modulator in the aorta. The Multi-layered Flow Modulator procedure involving a thoraco-abdominal aortic repair is a skilled procedure done in only most specialized centers in the world not only because of the anatomical complexity but also due to the fragility of the patients in whom these aneurysms occur. Such repairs are complex, time-consuming and impose a systemic injury upon the patients, regardless of whether the repair is performed by open surgery or via a branched technique. The considerable risks associated with such repairs include dialysis, paralysis and death in extreme cases. The multilayer flow modulator (MFM) is an innovative technology which is minimally invasive and reproducible treatment option. Behind its clinical effectiveness is the use of technology based on an entirely new concept of physics in which the blood flow is modulated by a 3D wire mesh to remove the turbulence within the aneurysm sac while the branches to the important organs are not interrupted. This makes the treatment very safe. The difference in the conventional stents and the multi-layered flow modulator is the size of the latter device that is ten times the size of a stent used in the conventional method. The 3D multi-layer aspect of the device also assists in regulating the blood flow smoothly.